Right now, there are just a few smartphones manufacturers who haven’t yet gone for a notched display. The list includes Samsung, Sony, Motorola, Google etc. Some recent leaks have hinted that Google Pixel 3 XL is coming with a notched display and today, the Motorola One Power leaked in full glory. So far, we have seen Motorola launching phones in C, E, G, X and Z series only but looking at the competition from the other Chinese companies; it looks like Motorola is also going to launch a phone with a notched display. 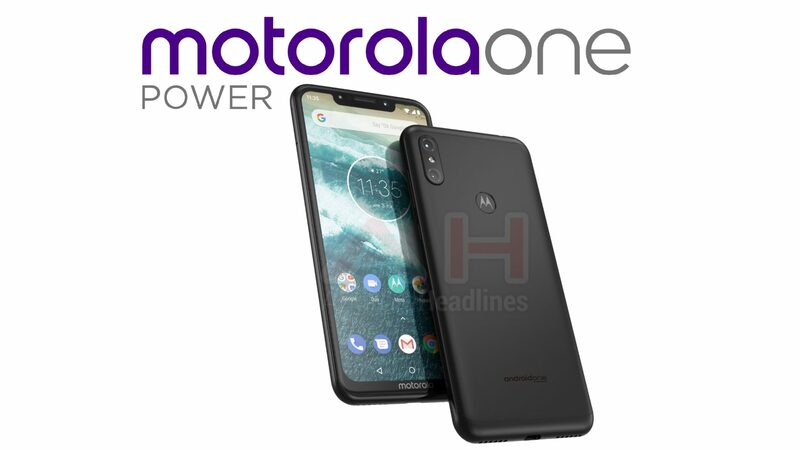 As the image above shows, the Motorola One Power (that’s a really bad name for a phone!) has a 19:9 display, thanks to the huge notch on top. The notch looks much like that on the iPhone X than the one on recently launched Android smartphones like Huawei P20 and the OnePlus 6. There is a vertical dual camera setup on the rear, just like the iPhone X. Well, this phone again shows that gone are the days when we used to have unique smartphone designs from different smartphone companies. These days, everyone is copying the iPhone X’s design by adding notches and vertical dual cameras. Anyways, talking about other details, the Motorola One Power is going to be an Android One device so, it is the second Android One handset from Motorola after the last year’s Moto X4. We are not sure if the phone is going to launch in other markets with Android One, but in the US, it will surely arrive with Android One branding. The fingerprint scanner is placed at the perfect location, i.e., underneath the batwing logo on the rear. We have seen Motorola’s dual camera phones having not so good portrait mode so, with this upcoming device, we are expecting a telephoto or a depth sensing secondary camera for better portrait shots. There are no details about the specifications or the pricing, so we will have to wait for some more information. Stay Tuned.